Laural Porter, KGW News Anchor and host of KGW’s current affairs show, emceed the event on September 19th with more than 560 Girl Scout alumnae and community supporters in attendance. The event raised over $160,000 to implement the Girl Scout Leadership Experience and enhance programs in financial literacy, healthy living, STEM (Science, Technology, Engineering and Math) and outdoor skills for more than 14,000 girls throughout Oregon and SW Washington. 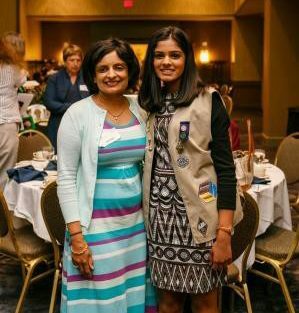 Jyoti and Karina Shah, both Girl Scout Highest Award recipients. Karina was the 2016 Gold Award speaker at the luncheon sharing her project of providing technology training to older adults in retirement facilities. Girl Scout Alumni Robyn Shuey and GSOSW Board Member Barbara Gibbs proudly display their uniform sash. The event’s success was bolstered by a $25,000 Challenge Grant generously given by Wells Fargo. The match was met and exceeded thanks to the incredible support of alumnae and community. The event’s Gold Sponsors included The Standard and Portlandia Club Inc. Silver sponsors are Brown and Brown, Ferguson Wellman, Cambia and Garrett Hemann Robertson P.C. “You know what Bluebird would say… a Girl Scout can do anything,” honoree Sally Bany reflected on her grandmother, Marie Lamfrom who served as a troop leader for a special needs troop in Portland for 35 years. She served on the Girl Scout council’s board of directors and received the highest award a Girl Scout adult can receive, the Thanks Badge. Lamfrom co-founded the company that would become Columbia Sportswear. For more information, or to express interest in sponsoring the 2017 Women of Distinction Luncheon, contact Shannon Spencer at [email protected] or call 503-977-6843. Our council serves nearly 15,000 girl members in 37 counties with the help of over 10,000 adult members. The Girl Scout mission is to build girls of courage, confidence, and character, who make the world a better place. Every opportunity in Girl Scouting develops these essential skills in an all-girl, inclusive, safe environment. Our century of success is demonstrated by the fact that 70 percent of female CEOs on the Fortune 500 list and 59 percent of women serving in the U.S. Congress are Girl Scout alumnae.